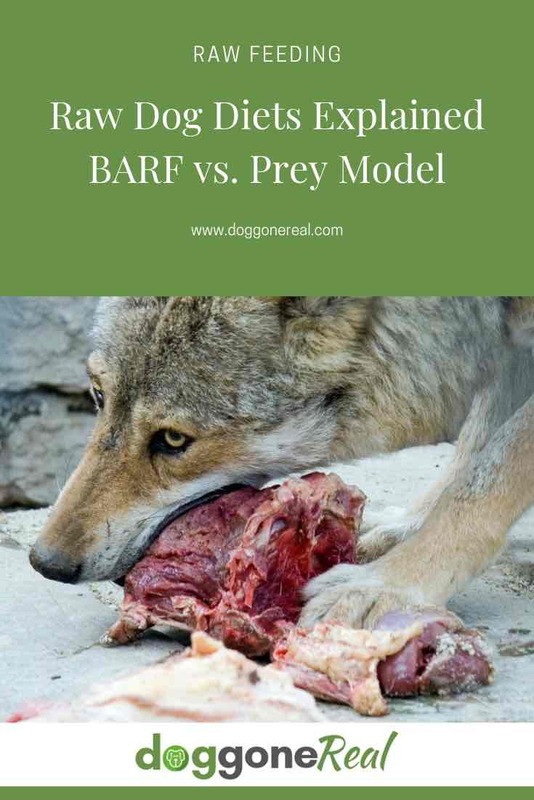 There’s a lot of controversy over which is better, the BARF vs Prey raw diet model. We will review both and share our thoughts on each raw diet model. There’s a lot of controversy over which is better, the BARF vs Prey raw diet model of raw eating, so let’s discuss both and then I’ll share our thoughts after much study and experience with our own beloved dogs. But these are our opinions, and I invite you to experiment and see which model best nourishes and pleases your dog. Let’s first start by understanding how similar dogs are to their wolf ancestors and understand what wolves eat in the wild. Biologist Robert Wayne examined the DNA of 7 breeds of dogs and 26 grey wolf populations and it was determined that dogs are different than wolves by only 0.2%. That’s 2/10’s of 1%! Comparatively, dogs differ from coyotes by 4% which is the same difference of man vs. chimps. So despite their appearance and diversity, dogs are still wolves. And, as a result, the dog diet should not be very different than the wolf diet. The premise of a raw diet/primordial diet is that dogs should be fed what their ancestors enjoyed. 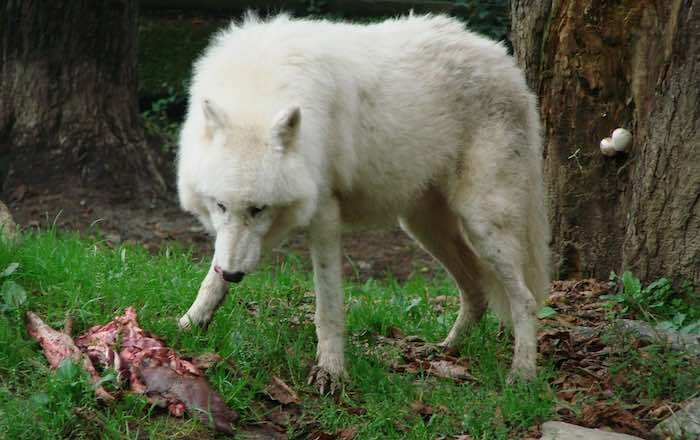 If we understand what wolves eat in the wild this will aid us with what dogs should eat. Wolves eat whole, wild prey with fur, feathers, feet, organs and glands. This is nutritionally complete. Wolves are also known to eat berries and other vegetation when meat is hard to come by and there are health benefits to the other nutraceuticals that the fruits and vegetables carry. That said, let’s compare the various raw diet feeding models. The Prey model replicates the diet of a wild canine of feeding on whole prey without requiring your dog to actually hunt and kill wild prey. The prey model includes eating the fur, feathers, feet and all which might be a bit much for some. It eliminates all processed foods and grains, however, Prey Model feeders are of the opinion that fruits and vegetables are filler foods that dogs don’t need, and I’m not one to argue with them. There is plenty of research that supports both sides, so our humble suggestion is to try both models and see which one your dog prefers and if you notice a difference in its health and vitality. Followers of the Prey Model have valid points in their position that dogs, whose stomachs are highly acidic in order to protect them against bacteria and other pathogens found in raw meat, should promote a strongly acidic internal environment for ideal digestion and safety. The pH of dogs gut when fed raw is 2.0 which is acidic. But, if fed kibble and starch the dog’s stomach pH will become more alkaline and inhibit proper bone digestion and allow for bacteria to exist. This raw feeding model adheres to the same strict guidelines as the Prey model, but The “Franken Prey” diet assembles various parts from different animals and combines them in a way which over time will simulate a whole prey diet. The rather unappetizing acronym BARF stands for “biologically appropriate raw food” and is also referred to as “bones and raw food.” BARF is a raw diet designed to provide dogs with a homemade diet that consists of raw meat and bones as well as vegetables, fruits, and dairy while eliminating all processed foods and grains. Supplementation considered acceptable. People new to raw food may appreciate that the BARF Model is much less restrictive than the Prey Model. As mention, the BARF diet includes fruits, vegetables, and other food sources that some people don’t believe dogs need, but I personally lean toward this diet. It’s my belief and experience that dogs benefit from the vitamins, minerals, phytonutrients, disease-fighting antioxidants and omega-3 fatty acids in wholesome fruits and greens to boost immune system function and provide fiber and enzymes for more rapid evacuation of waste and toxins. If choosing the BARF model, it should be noted that the fruits and vegetables should never become a large portion of your dog’s diet. It’s also important to select the appropriate fruits and vegetables that are healthy and safe for dogs and prepare them in a manner that allows for optimal nutrition absorption. Dog’s don’t have the teeth, jaw structure, or salivary enzymes to begin the digestion process in the mouth. That said, if you choose to add fruits and vegetables to your raw dog diet it’s best to puree, steam, or ferment them to ensure the best nutrient absorption. May include supplementation to offset nutritional deficiencies caused by lack of eating fur, feathers, etc. Variety is key with all raw diets and the balanced diet can be achieved over time (2-4 weeks) vs. achieving a completely balanced diet on a daily basis. 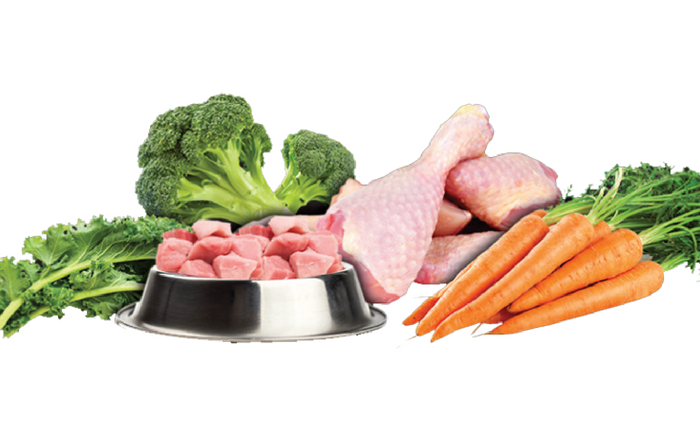 We at Doggone Real suggest you evaluate both the BARF vs Prey raw diet and pick a model that makes the most sense to you and see how your dog performs after a few months. If you find your dog has gas, evacuation or breath issues after it has had ample time to adjust to the new diet, try the other model. Dogs, like people, are different in what they prefer and what they can digest easily. Whichever model you start with, BARF vs Prey, you’ll likely find rapid improvement in your dog’s vitality, weight, and lust for eating, so you can’t really go wrong either way. What dogs DON’T need are grains, beans, legumes (like peanuts and peanut butter – sorry, Fido!) and other dangerous and/or empty foodstuffs. Get all the doggone goodness delivered right to your inbox for FREE. DISCLAIMER: All information presented on this website is for educational and/or informational purposes only and it is based on personal experience. I am not a veterinarian or veterinary nutritionist and this information has not been evaluated by such parties. This website is not intended to diagnose, treat, or cure your pet and it is not a substitute for medical treatment. Always consult with your veterinarian regarding your dog’s health concerns. AMAZON AFFILIATES PROGRAM: DogGoneReal.com is a participant in the Amazon Services LLC Associates Program, an affiliate advertising program designed to provide a means for sites to earn advertising fees by advertising and linking to Amazon.com. AFFILIATE DISCLAIMER: Additionally, we may participate in other affiliate programs to promote products we love and trust. This helps us generate some income to support this website.